Home > biracial families, labor, Parenthood, race > Parenthood: "She's So White!" While I was party planning this afternoon, I started watching last night's episode of 'Parenthood'. Barely five minutes in, I fell over laughing when Crosby held up his newly-born daughter and exclaimed with shock, "She's so white!" And 10 minutes in, I nearly died again when Grandpa Braverman said, "She's even lighter than she was in the hospital!" and then expressed his confusion at the term light-skinned. Ah... All of this is so familiar to parents of biracial children. Pop Culture Dad and I had the same reaction when Little Diva was born. I mean, we knew she would likely be born much more pale than she would eventually end up. Many black children (particularly with lighter-skinned parents) and most biracial kids are. My doula with Little Diva has biracial grandchildren, and she tried to prep us for the possibility before we went into the delivery room. This wasn't an earth shattering revelation. I was a pale child, and I've been around plenty of black and biracial newborns. I don't know any black person who would be particularly shocked by the revelation that some black and biracial babies will be darn-near white at birth. What Pop Culture Dad and I were not prepared for, however, was that our then-blue eyed (now green), pale child, would pretty much stay pale—very pale—for years. My multi-ethnic mother comes from a long line of "high yella" women. My dad's mother was also very beige. But I'm brown. And my mother-in-law is a pretty deep tan. My husband isn't even that pale himself. Somehow, though, for the first three-and-a-half years of her life, our baby girl was lighter than her father. All of this "nanny" and "OMG, she looks white" [she does not] stuff is perhaps why immediately after giving birth to Super Girl, I exclaimed, "Oh, thank goodness! She has some color!" No one wants to be called the nanny. 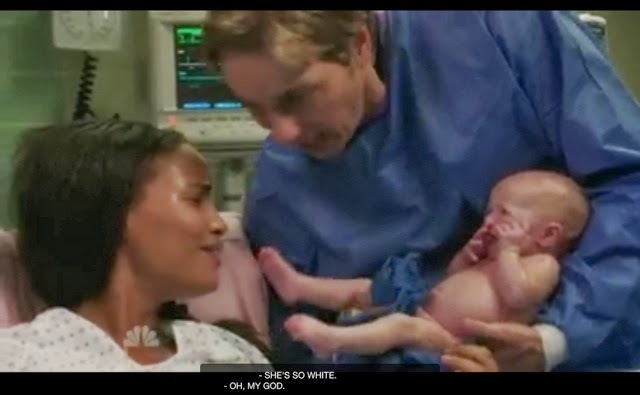 I'll be interested to see as the season plays out, if Jasmine will experience any of the "Uh... Is that... um... your baby,... or, uh... are you the, um....?" nonsense that so many black mothers of biracial (or just light-skinned) babies deal with. If there are any black writers (or white writers with biracial families) on staff, I imagine it's coming.